I am also on a quest to run 14 distance events in 2014, and am off to a less-than-ideal start. I ran a virtual 14K about a month ago on an unusually warm January day in Iowa. 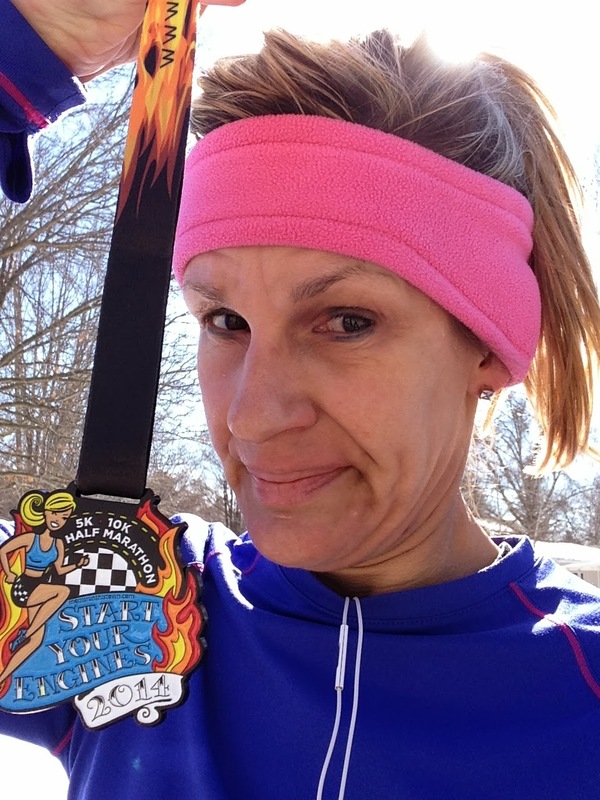 I have a virtual half marathon scheduled for March. And I have had a virtual half marathon on my February calender, awaiting the "perfect" day to run the 13.1 miles to call it complete. And there have not been any "perfect" days to run those 13.1 miles...until today. Granted, it was a virtual event. I certainly could have run it in increments (in which case I would have had it already finished within the first week of this month). Or, I could have waited until we have some actual spring-like weather next month (and no one, other than myself, would know). I even could have just not worried about it and done nothing. I had already received the medal in the mail and didn't have anything to prove to anyone other than myself.....but that's the kicker. I know I can run 13.1 miles non-stop (have I ever mentioned that, prior to today, I have run 17 half marathons/20K's?). Knowing I have the "skill set" and the ability, my OCD won't allow me the luxury of not running the full distance in any other manner than all at once. Our family has been busy with weekend dance competitions for the youngest daughter and swim meets for the son. And, we have had a lot of snow and extreme cold. Excuses aplenty. Our daughter's final dance performance isn't until tomorrow afternoon, so the idea came to me to just run the virtual race this morning (when I'd much rather be making waffles and/or spending idle time on the computer). The temps were "moderately warm" (in the low 30's) at the start of my "race time." My impromptu plan was to head out around 9:00 and just go for it. I usually can run a half marathon in two hours, give or take a few minutes in either direction. I usually train for my halfs, though(oops). With the inclement weather, I hadn't run farther than the 14K (8.7 miles), and that was only once. True, I have been running my usual 3-4 times each week, typically going anywhere between 3-6 miles each time. And, when I ran the 14K, it wasn't much of a challenge to run that little bit farther.. So, I (tech)suited-up and left the house with an open mind. The goal of this "race" was simply conquering the distance, not a fast finish time. Either way, it would be a PR of sorts since it was my first half marathon in a winter month (always looking on the bright side). The temps were comfortable, not much for sunshine, but also not much for wind....so all was well. It felt great to have my course mapped out for me (most of my runs are a little on the spontaneous side, so I don't usually have a plan or distance in mind when I'm not in training). Just having the pressure gone from worrying about when I'd get this virtual run scheduled (and to be actually running it!) was so liberating. It also felt great to be on one of my routes from when I trained for my 26.2 last summer. This route would take me out to the middle school (a 5-mile loop from my driveway) and I was planning on an additional 2-mile out-and-back. That would give me a total of 7 miles, do a quick pit-stop at my house, and then finish with a couple of 3-mile loops near the college campus (a few blocks away). Even though my finish time was not a priority, I still had my watch with me to monitor my pace. 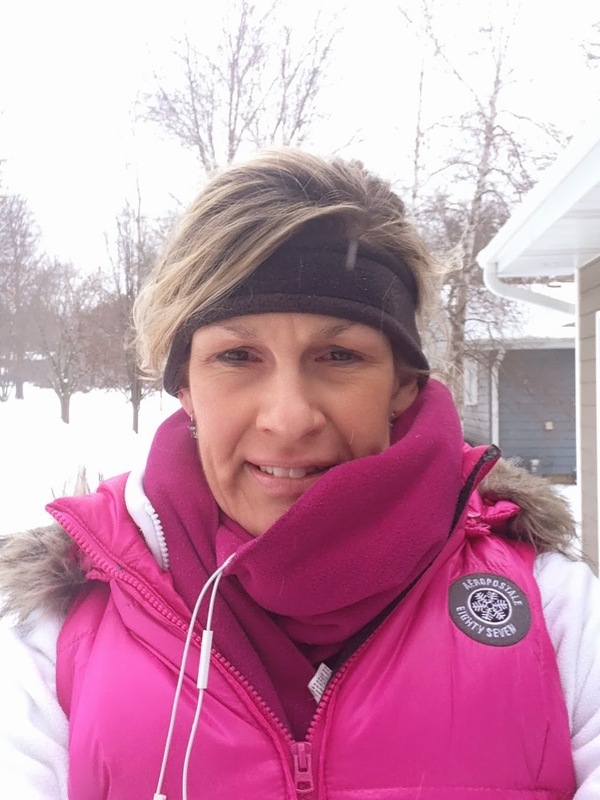 I had to walk a few times (due to some random ice and puddles), but I was able to keep a strong 10-minute pace. I had just finished the 2-mile out-and-back, and was feeling great so I decided to do an extra 1-mile out-and-back on my way back to my house. As I was finishing mile 7, I could feel the start of some stiffness in my upper hamstrings (I have been feeling this "stiffness" a lot recently, I think I'm due for some new shoes). I could tell my pace was slowing some, but I was so happy to be out in the sunshine (which emerged around mile 5), it didn't bother me. I finished mile 8 at my driveway and headed in the house for my scheduled pit-stop. I needed a potty break, some water and a few more energy chews (and a peanut butter and raspberry jam rice cake). Since I had the opportunity, I also changed my clothing (I had been wearing 2 lined tech shirts under a puffer vest, and I was feeling very sweaty). With 5.1 remaining miles, I chose to leave the puffer vest behind. The sun was shining brightly, and the temps were now in the mid-high 30's, I'd be fine without it. Since I'd run that additional 1-mile out-and-back before my pit-stop, I needed to do change my route for the remaining miles. I decided to run two 2-mile loops near the college, and finish with a 1-mile loop around the central campus. I definitely could feel my legs getting fatigued, especially my calves, but my energy level felt great. I kept checking my pace at each mile, and it hadn't slowed much. I did have to walk a few times in the final mile. I could feel some strain on the outside of my knees, and I did not need to be a hero. My actual "race time" was 2:13:03, not bad considering I had walked several times. So, was this a smart move, running this kind of distance without training properly? Probably not. Even though I have run several races of this distance (and many training runs that have been much longer), this took some effort. It was exhilarating to run this, and it was great that my pace was pretty strong despite not having run 13.1 since late October......but I will have some stiffness and discomfort as a result. Thankfully, my body has done this distance numerous times. I'm lucky this run was as easy as it was. So, onward! I have until April 1st to complete my next virtual half marathon.....and I will be much better prepared for that one. Maybe a spring PR? Virtual races. Kind of a new buzz word (words?) gaining in popularity within the running world. Virtual races are organized usually around (or in support of) a general theme. More often than not, they are fundraisers for a charity or benefactor. Many are scheduled to take part on a specific day, but most allow the participants to run the "event" at their leisure over the course of a few days or weeks, in their own home town. Since these are used to fund raise and promote awareness of the benefactor(s), there is usually a minimal fee ($25-$30), but this can vary if there are t-shirts available or finisher medals commemorating the event. You do have the option to simply just run these races for free, but you will not be in the loop for prizes (yes, some of these virtual events have real prizes for the registered participants!). So, why do a "virtual" race when there are plenty of "real" races to choose from? Actually, depending on where you reside, the events may not be so plentiful. For example, I live in a medium-sized town in Iowa. I have some larger cities within 1-2 hours of drive time that have races, but it's not always convenient for me to drive those 1-2 hours. (I have a husband, and two kids still at home.....and I enjoy spending time with all of them). Our son is on the high school swim team, almost every weekend in December and January, he has a swim meet (and we want to watch and support him and his team). Our youngest daughter is an accomplished dancer, and is a member of her studio's competition team. She has dance competitions almost every weekend in February. So, for myself, that's three months with limited availability for weekend racing. I haven't been a big fan or participant of virtual races, until recently. I want to be a better distance runner, and you become a better distance runner by running long distances, year-round (not just during the race season). So far, my virtual resume' includes a couple of half marathons, and a 10K. Last week, we were blessed with temps in the mid-40's, so I took advantage and did a virtual 14K ..I almost didn't get that completed before the event's end-of-the-month deadline. I have another virtual half scheduled for this month, and one in March as well. How does one participate in a virtual race? You can find the events online. Most will have a link to take you to their website, where you can register. Most events give you options on what distance you want to run (5K, 10K, half or full marathon). Some events take place on a specific date, others will give you some allowance on when you can run your event (many will also allow you to run the distance in increments). I prefer to run the distance all in one outing, but there are no satellite cameras watching me....if I need to loop back to my house for a pit stop, I do it (guilt-free). Some events also encourage you to post your "finish times" after you have completed the race, and you may even win a prize for doing so. Why, oh why, am I doing these? As mentioned, I want to stay on track with my distance training, and by having an event on my calender (real or virtual), helps me stay consistent with my running. Sure, I could simply run the long distances for free, but when I pay for a virtual event I have the satisfaction of also supporting a cause greater than myself, and if I get a decent run completed (and a medal to show for my efforts)....well, all the better. I'd call that a win-win. Have you ever done a virtual event? What cause or charity did you support in doing so?